The International Visual Sociology Association invites abstracts for its 34th annual meeting, to be held at Lillehammer University College, Norway, June 22-24, 2016. We encourage submissions from those interested in the visual research and thinking from sociology and related social sciences; communications and media; cultural studies; film and photographic studies; photojournalism and related practices. We encourage those unfamiliar with visual methods and analysis to visually innovate and experiment in their respective substantive specializations. The IVSA is rooted in the discipline of sociology but welcomes participation from a wide range of disciplines. Preference will be given to presentations that use visual material (images or video). Please note: the list above is suggestive and not exhaustive. As the first conference to address this important theme, we expect a wide range of creative approaches, ideas and presentations, including papers with images, videos, photo essays, multi-media, fine arts and other modes of visual expression. Information on how to submit is forthcoming on http://www.visualsociology.org. Deadline is January 15, 2016. If your proposal is accepted you will be invited to join the IVSA in order to participate in the conference. June 22-24, 2016 in the town of Lillehammer, Norway. The Conference will be hosted by the Faculty of Social Science at Lillehammer University College. During the days of June 22 – 24, visual scholars and artists from around the world will gather to share their research and network in paper sessions, workshops, film sessions, exhibitions and social events. The theme for this conference will be “Visualizing sustainability: Future imaginations.” The conference will take place at Lillehammer University College. Lillehammer is less than two hours by train from Oslo International Airport with direct flights from many cities in and outside Europe. For this year’s event we ask the visual sociology community and related disciplines to problematize and challenge the concept of environmental sustainability. How can we visualize what sustainability is and what it is not; what are its signs and characteristics? We ask you to use your visual imagination to explore the issues related to sustainability on a local and a global scale. As is our practice in all IVSA conferences we also welcome generalist submissions dealing with visual methods, theories, and other central issues in visual sociology, as well as visual analyses of society and culture. … The common claim of these and other projects is to be able to change the world by making both the world as it is and the change has it happens visible: in everyday life (definitely on the street yet increasingly also on the web it seems). Whether or not successful in achieving the specific aims of each project, they give an example of the visual arts’ possibilities – and growing confidence – for making their voice seen in creative local and trans-local (urban) interventions. Yet the strong focus on images of this kind of visual ‘street politics’ also attracts criticism routed in the concern that the social dimensions of life, space and politics are too fast and too easily thrown over board pursuing streamline communication design and maximum media impact. Where do you stand? And where does this practice figure within the methods and theory of visual sociology? A ISA T05 call for papers is open (here) till December 15th, 2011. Comments are welcome, too. The 2nd International Visual Methods Conference invites academics and others who work with visual methods to take part in presentations and discussions, as well as a programme of workshops, viewing a variety of exhibitions and screenings. 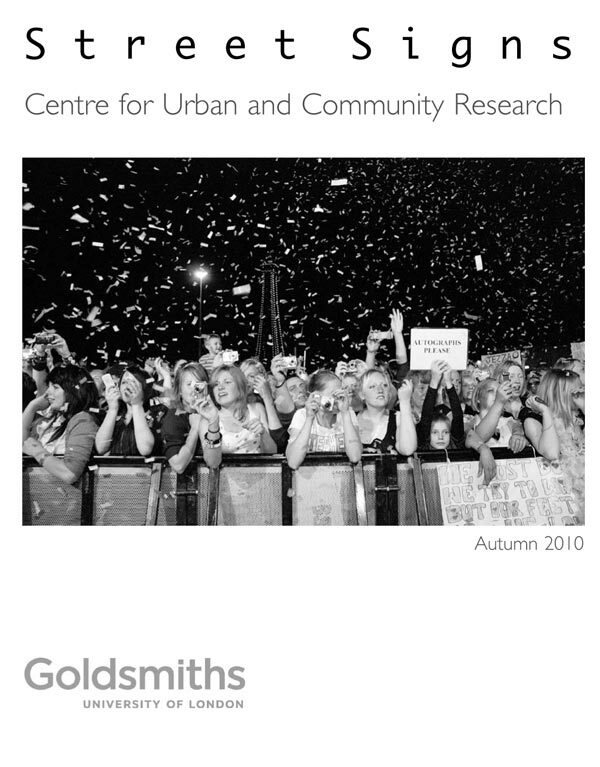 Street Signs is the magazine for the Centre for Urban and Community Research (CUCR/Goldsmiths). 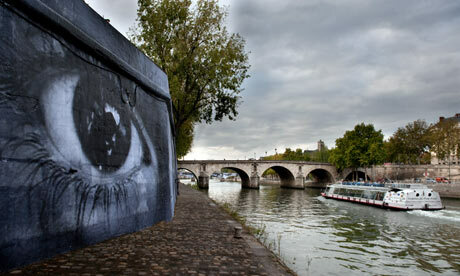 It is a forum for exploring the cultural life of cities through writing and photography. Street Signs is a place to play with ideas and to experiment with ways of writing. Contributions to the magazine range from academic to creative and fictional. I think this conference which is organized by post-graduate students of Culture, Film and Media and has targeted early career researchers, is an exciting opportunity for us to contribute. Following our discussion on the political implications of research whereby I noticed the collective desire for politically charged interventionist act between students, I suppose this conference could be a wonderful platform for us to conceptualize counter-hegemonic spaces related to our research areas. We can discuss concrete and virtual spaces we are working on in our project, hear about the similar papers, meet people who have common motivations and assess our own ideas here. I intend to send an abstract and contribute and I suggest you to do the same. Deadline for abstract is 3rd November. “This two day international conference for postgraduate and early career researchers explores interdisciplinary conceptions and representations of radical, counter-hegemonic space. As concerns grow over such issues as spatial privatisation, commodification and homogenisation, surveillance, extra-legal spaces, social and political ‘non-spaces’, and the loss of common or public spaces, so too a plethora of interventions—across genre and disciplinary boundaries—have been launched in opposition to these trends. Examples are diverse, and can be found, for example, in literary studies of estranging narratives in contemporary fiction; spatial representations in film, TV and new media; the creation of critical spaces of alterity in political activism (such as semi-autonomous zones); psychogeographical spatial strategies, and philosophical and theoretical conceptions of counter-hegemonic space. What estranging utopian, dystopian, post-apocalyptic and science fiction spaces of alterity are being utilised in contemporary aesthetic and cultural productions, e.g. film, literature, TV, art, computer games? How do these narratives travel across media and what changes occur when they are adapted, reworked and transformed? What research questions are raised by such collaborations, transmissions and intermedial dialogues? How can we approach traditionally-understood print and audio-visual texts in relation to virtual spaces of alterity, such as fan-based communities, social networking sites and other sites developed through user-generated content (UGC)? What are the relationships between textual spaces of alterity and non-textual forums, communities and dialogues? What physical spaces of alterity are being constructed in contemporary urban environments? How are such spaces critical, oppositional or subversive and how do they draw on the contributions of local communities and organisations? How do spaces of alterity which are informed by traditionally-understood “texts” function on the Internet and how can they inform our understanding of filmic, visual and literary textual methodologies and approaches? What forms can counter-hegemonic, avant-garde, or ‘subtractive’ spaces—which can be spatial, but also temporal or conceptual—take? What political, artistic, or scientific practices can such spaces foster? How does distance from institutions help form alternative political, literary and artistic practices?